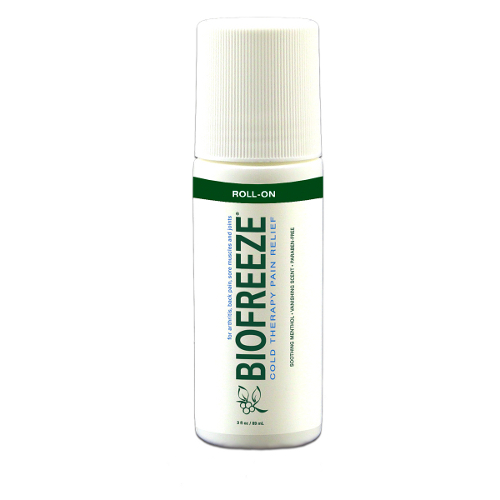 The Performance Health Biofreeze Pain Relieving 3 oz Roll-On is an effective natural pain relief for sore muscles and joints. The roller ball allows for product application without the need to use hands. The Performance Health Biofreeze Pain Relieving 3 oz Roll-On is an effective natural pain relief for sore muscles and joints. The roller ball allows for product application without the need to use hands. It also provides a nice massage for soft tissue wherever you apply product, and can be used in trigger point therapy. New, Improved Biofreeze is now more natural with an enhanced botanical blend and now no parabens or propylene glycol. The new botanical blend includes ilex, arnica, aloe, boswellia, calendula, green tea, burdock root and lemon balm. Applies easier and penetrates quickly with two effective skin conditioners, Vitamin E, and aloe. Also comes in original green w/hands free applicator.